I am a dreamer. I have a very active fantasy life where I have scenarios of all kinds playing through my head such as what it would be like to win the lotto, come face to face with a coyote at 5:30am and maybe my life as a soap opera. What can I say? I’m a young, single, female engineer living in suburbia. I have to find a way to break the monotony of my day to day. One fantasy I will continually harbor is the day I make the perfect chocolate sponge cake for a cake roll. I’ve been attempting the same recipe word for word multiple times (this is my fourth attempt) and every single time something is wrong. This time it was no different. The recipe I keep attempting is one from Joy of Baking. It seemed simple, but for whatever reason, it always comes out looking terrible (but still tasty). This time I figured I had to get this right. I mean it was my fourth attempt right? So I decided to make this for Father’s Day. 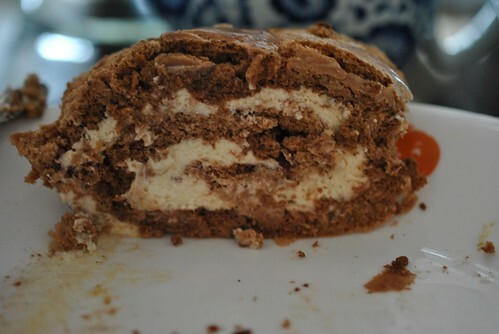 My father really loves Tirimisu, so I decided to do Tirimisu in a cake roll, where I would use a Chocolate Sponge Cake (as the lady fingers) and roll it with a Tirimisu filling. First I made the Chocolate Sponge Cake. I separated 6 large eggs and let them come to room temperature. 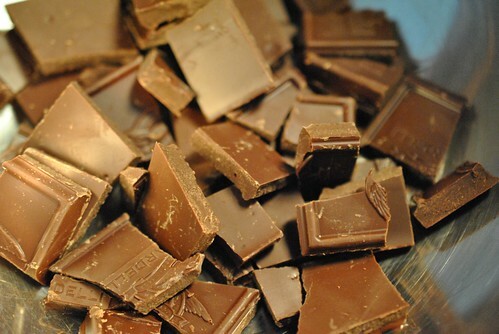 As they were warming up, I melted 4oz of a semi sweet chocolate in a double boiler and let that come to room temperature. After the eggs were at room temperature (I gave it about 30 minutes), I beat the egg yolks with 50g (1/4 cup) of sugar until it was light, thick and fluffy (about 5 minutes). Then I beat in 1 teaspoon of vanilla extract and added 1/2 teaspoon of espresso powder (for the coffee dimension) then the melted chocolate until it was combined. I put that mixture into a separate bowl and cleaned the mixing bowl and dried it real good for the next step. Into the bowl went the egg whites, and with the whisk attachment I beat the egg whites until they got foamy before adding 3/4 teaspoons of cream of tarter. Then I continued beating until I got soft peaks before i slowly added 30g (2 tablespoons) of sugar and continued beating until I got stiff peaks. I took a scoopful of the beaten egg whites and mixed it into the chocolate mix to loosen it up a bit. Then I folded the egg whites into the chocolate mix. Then I poured it into a sheet pan lined with parchment paper, greased with some Pam Veggie Oil. Then into a 350degF oven it went for 15 minutes. Once it was done (not shiny and springs back when poked), out of the oven it went, and I let it cool on a wire rack covered with a clean, slightly damp towel. While that was cooling, I made the tirimisu filling from Cooking for Engineers. 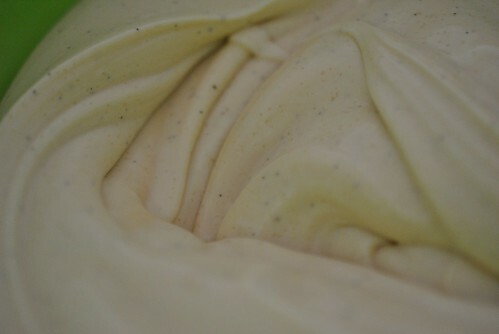 I mixed together 1 pound of marscapone cheese, 1/2 cup of sugar and 3 tablespoons of a good vanilla extract. Then in a mixing bowl I poured in 1 cup of heavy whipping cream and with the whisk attachment, whisked until stiff peaks. Then I folded it into the cheese mixture. 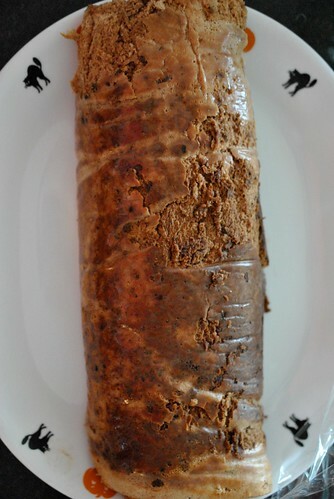 Once the chocolate sponge cake was fully cooled, I dusted it with some cocoa powder, spread about half the tirimisu filling onto the cake, dusted more cocoa powder and proceeded to roll it up. This is where everything just fell apart. 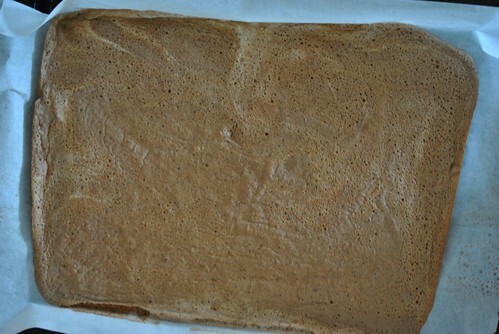 First, the darn cake had sticky spots where it just would not release from the paper. I have a feeling the cake could have spent an extra 5 minutes in the oven. No matter, I kept going. I was going to make this work! After fighting this thing, I finally got it rolled up and onto a plate. It looked so pathetic. 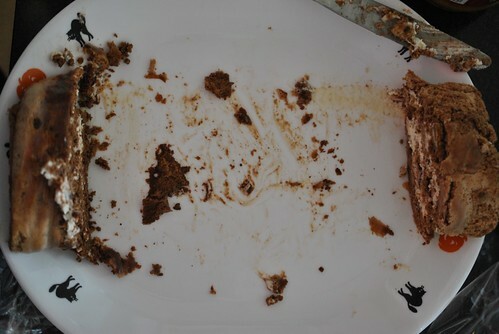 The chocolate was not fully mixed in and left a rather unattractive splotchy pattern on the cake. The filling was a bit soft, so it just looked flat. I covered it with some plastic wrap and threw it in the fridge. Maybe it just needs to set up a bit. The next day, it was apparent that the dessert fixer gnomes did not pay me a visit, so I had to do something. After contemplating whether to cover the thing in melted chocolate or the extra filling I had, I decided to cut off the ends and stuff it into a loaf pan, then cover it with the left over filling. Very tirimisu like! In the end, it was actually really tasty. The addition of the espresso powder in the chocolate sponge cake did a great job emulating the coffee soaked lady fingers. There was a bit too much of the filling, but it was good enough to eat alone anyway. 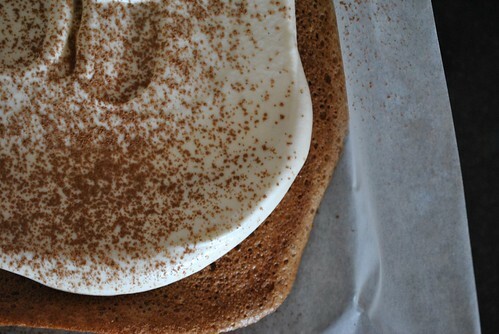 One day, I will be successful in making a chocolate sponge cake, but for now, I’ll just keep fantasizing about it. 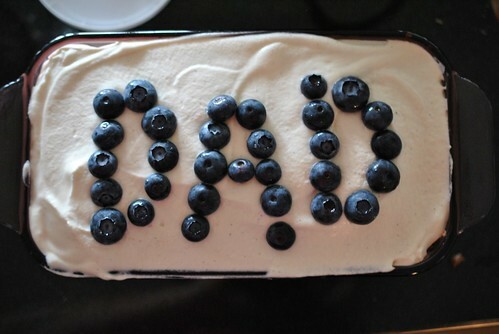 This entry was posted in Cake, cheese, Dessert and tagged chocolate, father's day, marscapone, Sponge Cake, tirimisu. Bookmark the permalink. I think it looks pretty darn tasty! 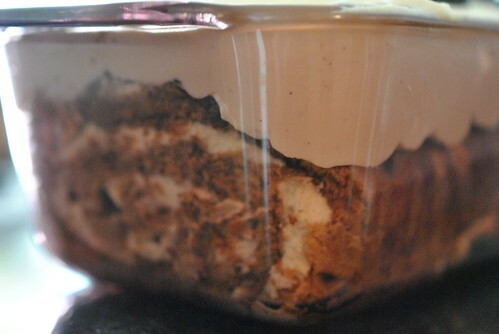 I’ve always loved tiramisu and have ached to make it at home, but haven’t taken a stab. This recipe looks promising though, even if it was a PITA.